Have an Account? Sign in to choose recipients from your Address Book. By clicking "Add to Cart", you accept the "Delivered Monthly" Program Terms and Conditions. Click here for the Terms and Conditions. Made with a traditional Italian recipe and wholesome, natural ingredients, these twice-baked cookies are great for dunking in coffee or the hot beverage of your choice. The delicious vanilla almond biscotti have real almond pieces. Scrumptious pumpkin pecan biscotti have real pecans and spices reminiscent of pumpkin pie. Chocolate-dipped almond biscotti have a wonderful almond flavor and are drizzled in rich chocolate. 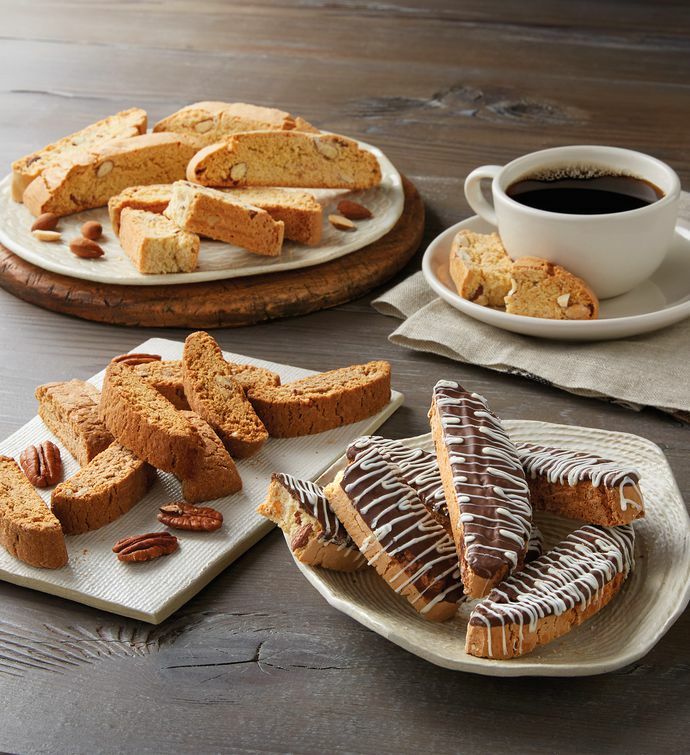 Sweeten mornings or afternoons with this delightful biscotti trio. Now you can look forward to the most up-to-date information on Wolferman's gourmet bakery, including exclusive offers, special events, and recipes. Sign up for emails and be the first to know about exclusive offers, events, and new items from Wolferman’s.